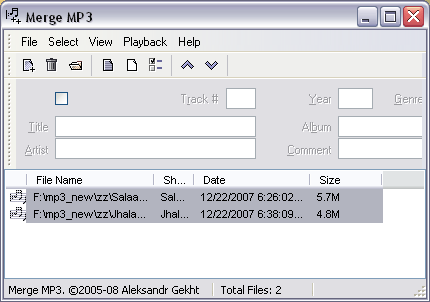 How to merge & join multiple mp3 audio files into single mp3 file? Are you looking for dead simple way to merge multiple mp3 audio files? There are number of free and paid software to cut, edit and merge mp3 files. However, most of these software leave user confused and going through tutorials in performing simple task of editing audio files. Well, cut the crap and perform this simple task of merging multiple audio files with a super simple application “Merge MP3“. It is a free application which does not require installation. Just download, unzip and start using. It does not have whole hog of features but does the basic task of merging mp3 files like charm. If you are looking for easy way to create a soundtrack from pieces or parts of your favorites mp3 songs – then first cut the selected parts of mp3 files using MP3 cutter and then merge snipped mp3 files into one Mp3 audio file using above utility. Easy, simple and quick, isn’t it?